In 1820, Danish physicist Hans Christian Oersted found that a current running through a wire created a magnetic field, kicking off the modern study of electromagnetism. Moving electric charges create magnetic fields. You can test this by placing a compass near a current-carrying wire. The compass will line up with the induced magnetic field. To determine the direction of the electrically-induced magnetic field due to a long straight current-carrying wire, use the first right hand rule (RHR) by pointing your right-hand thumb in the direction of positive current flow. The curve of your fingers then shows the direction of the magnetic field around a wire (depicted at right). You can obtain an even stronger magnetic field by wrapping a coil of wire in a series of loops known as a solenoid and flowing current through the wire. This is known as an electromagnet. You can make the magnetic field from the electromagnet even stronger by placing a piece of iron inside the coils of wire. The second right hand rule tells you the direction of the magnetic field due to an electromagnet. Wrap your fingers around the solenoid in the direction of positive current flow. Your thumb will point toward the north end of the induced magnetic field, as shown below. In this equation, θ is the angle between the velocity vector and the direction of the magnetic field. If the velocity of the charged particle is perpendicular to the magnetic field, sin θ = sin 90° = 1, and the force can be calculated as simply FB=qvB. Because force is a vector, it has a direction as well. 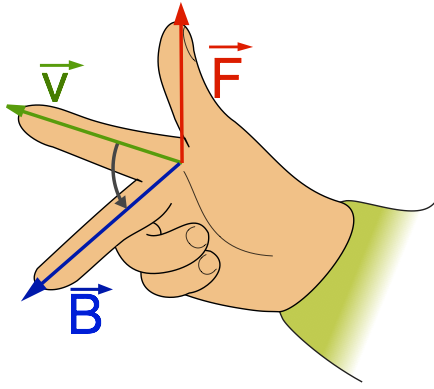 This direction can be determined using the third right hand rule. Point the fingers of your right hand in the direction of a positive particle’s velocity (if the moving charge is negative, point the fingers of your right hand in a direction opposite the particle’s velocity). Then, curl your fingers inward 90° in the direction the magnetic field points. Your thumb will point in the direction of the force on the charged particle. Question: An electron moves at 2.0×106 meters per second perpendicular to a magnetic field having a flux density of 2.0 teslas. What is the magnitude of the magnetic force on the electron? Question: A particle with a charge of 6.4×10–19 C experiences a force of 2×10–12 N as it travels through a 3 tesla magnetic field at an angle of 30° to the field. What is the particle’s velocity? Answer: (2) An iron core placed within an electromagnet strengthens the magnetic field. Question: The diagram below shows a proton moving with velocity v about to enter a uniform magnetic field directed into the page. As the proton moves in the magnetic field, the magnitude of the magnetic force on the proton is F.
Answer: (2) 2F. Because charge is doubled, magnetic force also doubles. When relative motion between a conductor and a magnetic field creates a force on the charges in the conductor, a potential difference is induced in the conductor. 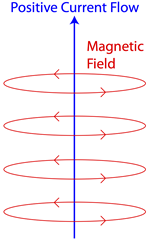 The conductor must cut across the magnetic field lines to produce a potential difference, and larger potential differences are created when the conductor cuts across stronger magnetic fields, or moves more quickly through the magnetic field. This phenomenon is what allows you to create usable, controllable electrical energy. Kinetic energy in the form of wind, water, steam, etc. is used to spin a coil of wire through a magnetic field, inducing a potential difference, which is transferred by the electric company to end users. This basic energy transformation is the underlying principle behind hydroelectric, nuclear, fossil fuel, and wind-powered electrical generators! Answer: (2) the induced potential difference will increase as the speed of the wire is increased. Question: The diagram below represents a wire conductor, RS, positioned perpendicular to a uniform magnetic field directed into the page. Describe the direction in which the wire could be moved to produce the maximum potential difference across its ends, R and S.
Answer: The wire could be moved to produce the maximum potential difference across its ends, R and S, by moving it horizontally (right to left or left to right).